I was planning on going to bed a few hours ago, but I didn't! Here's a power point presentation I made for younger CC scientists. 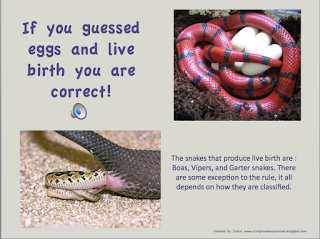 Its a powerpoint with questions and answers about the different forms of reproduction. I wanted to make something my children could watch over and over and I knew they would not click on something I didn't want them to see. So here is my faulty recording attempt to narrate and give basic facts about each of these living things. Afterwards you can check out the links below to get a better understanding of things. I know I needed it being that most of my answers would have been wrong. This is great for introduction or review. Here's a great link on Lady bugs' reproduction and mating. Here's a great link for Starfish info. This one is a bit wordy- so unless your child reads at a middle school level- it's best you just read and summarize for them. Here's a great one for snakes. And this is totally Kid friendly! This one makes a chart for us to see. Love it! Here's a great site for live birth. Here's another site for dolphins as well. Thanks! I loved your honesty on your last post. It and you're whole family is beautiful! I was nog able to download the powerpoint. I have a MAC, could that be a problem? My email is cannon circus@gmail.com. Thanks! But FYI: The link only works for a week. Kris, I tried sending it to your email, but it seems that it came back to me. :( Can you resend your email by comment again? I am not able to download this. Will you please email it to me?